After taking a trip to Norway, Billie Lourd posted an image of the Northern Lights, something her mother "had an otherworldly obsession with". 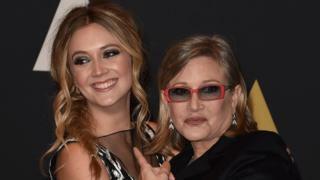 Reynolds' son, Todd Fisher, said the stress of his sister's death had been too much for her and in her last words, she had said she wanted to be with Carrie. Using a piece of dialogue from the box office hit, Hamill wrote on Instagram: "No one's ever really gone...". Hamill's character Luke Skywalker tells his sister, Fisher's Leia, that "No one's ever really gone" as they say goodbye. Actress Laura Dern, who also appeared with Fisher in The Last Jedi, described her as "a goddess". One wrote that the star "was terribly missed". Another said the world had "lost a princess".